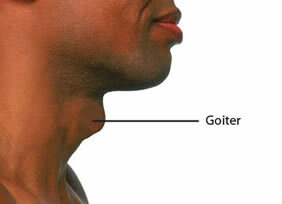 A Goiter is an enlarged Thyroid Gland, and usually causes no pain. As the gland enlarges, it may cause a visible growth under the skin in the neck, and may also result in a sensation of swelling in the neck. As the size increases, the gland may place pressure on the windpipe and esophagus, making breathing and swallowing uncomfortable. A low level of iodine in the diet is the most common cause of Goiters internationally. However, in the United States where dietary iodine is plentiful, Goiters more often develop as a result of thyroid hormones imbalances, nodules within the thyroid and certain auto-immune diseases. Treatment of Goiters depends on the size of the Goiter, symptoms and the underlying cause. Smaller Goiters with no symptoms do not require treatment. Surgical excision of all or part of the Thyroid Gland should be considered for Nodular Goiters causing Hyperthyroidism or Goiters compressing other structures in the neck which result in difficulty breathing or swallowing. Hypothyroidism and Hypothyroidism are conditions characterized by abnormal thyroid hormone production. Various diseases and conditions can result in Hypothyroidism or Hyperthyroidism. These conditions are commonly treated with medications and are best managed by internists and endocrinologists. Hypothyroidism Hypothyroidism is a condition in which the Thyroid Gland does not produce an adequate amount of hormones and is thus under-active. Hyperthyroidism Hyperthyroidism is a condition in which the Thyroid Gland produces excessive amounts of hormones. Common symptoms include shaking, nervousness, irritability, feeling hot, rapid and irregular heartbeat, muscle weakness, fatigue, frequent bowel movements, weight loss and hair loss. A Thyroid Nodule is an abnormal growth (lump) of thyroid cells within the Thyroid Gland. Nodules can be solid or fluid filled. The majority of Thyroid Nodules are asymptomatic, do not alter thyroid hormone levels and are non-cancerous (benign). Thyroid Nodules are quite common, occurring in up to 50% of the adult population. Since the majority of these nodules are very small and not symptomatic, they are not identified. Approximately 300,000 new Thyroid Nodules are found every year in the United States. Less than 5% of all Thyroid Nodules are cancerous. Since it is often not possible to distinguish between a non-cancerous nodule and a cancerous nodule, further testing is usually indicated to find the nature of the nodule. Nodules are often too small for the patient to sense. They are usually discovered by a physician during routine examination of the thyroid or incidentally noted during imaging of the neck for other medical problems. Occasionally, the Thyroid Nodule may become large enough so that it is visible through the skin or may press on the windpipe or esophagus, making it uncomfortable or difficult to breathe or swallow. Treatment options depend on the type of Thyroid Nodule present in the Thyroid Gland. Benign and asymptomatic nodules are commonly observed and followed with serial examinations. Surgery is usually recommended if the nodule is cancerous or if the nature of the nodule cannot be determined with testing.